The International Maritime Organization (IMO) is working on tougher measures to clamp down on rogue shipping companies trying to use flag registries fraudulently to conceal their activities, officials said. All commercial ships have to be registered – flagged in a particular country – partly to comply with safety and environmental laws. With international and U.S. sanctions imposed on countries including North Korea, Iran and Syria, some ships involved in such trade have used tactics to sidestep the measures including turning off their location transponders and falsely reporting their flag registry, also to secure insurance. Drug and weapon smuggling are among other areas of trade in which front companies attempt to conceal their activities to avoid being detected. The IMO agreed on a series of measures after a committee session last week which included the creation of a comprehensive database of registries and ways to improve information on the illegal registration of ships, the IMO said. Other recommendations included enhanced verification of vessels through their unique IMO numbers and adherence to the requirement for an onboard record of a ship’s history. The IMO will also work with the U.N. Security Council to create a searchable database that would show vessels subject to U.N. resolutions. The work is expected to be completed in 2021. 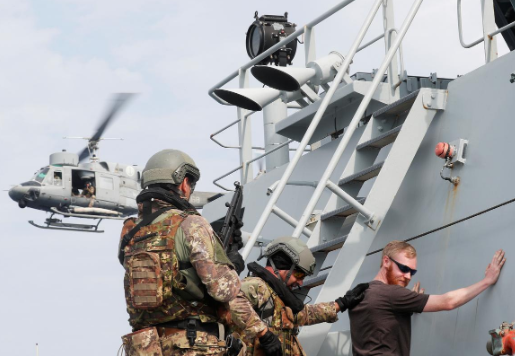 “Experience has shown that the raison d’être of fraudulent registries is to conceal illicit activity on board vessels, including activities prohibited by United Nations sanctions,” the United States said in one submission to the IMO. Multiple countries have reported to the IMO that their registries had been used without the knowledge of the maritime authority for fraudulent purposes through fake documents or even maintaining the flag after it had been terminated. Tanzania said it had experienced more than 20 cases of the fraudulent use of its flag since 2016, discovered after collaboration with other countries. Ukraine, meanwhile, says shipments from Crimea violate Western sanctions and has complained to the IMO, asking member states to de-list any vessels involved. Crimea has been under Western sanctions since Russia annexed it from Ukraine in 2014. In a statement to the IMO, Vitalii Moshkivskyi, Ukraine’s deputy permanent representative, pointed to “more than 80 ships unlawfully registered in the closed seaports in Crimea”. Moshkivskyi said such activity had “grave implications for the safety and security of navigation”. A spokesman with the Russian Federal Agency for Maritime and River Transport declined to comment.